Still fresh in our minds, about a month and a half ago, precisely on June 25, 2009, Michael Jackson, the king of world pop music, left us all. 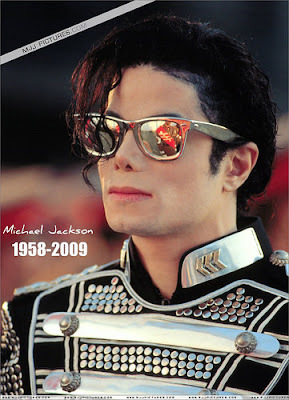 More than 1 billion people worldwide, witnessing the greatest entertainer funeral process of all time. I also got tears watching Michael leave us so quickly. We are both sad and touching, remembering what Michael has given us, to this world. What can we learn from the songs? Every day in the world, people fight for something. Racial, ethnic, religious or cultural issues make us fragmented. It has not been counted how many human victims of war either directly or indirectly. Should, no matter whether we are black or white, we are united and love each other as human beings. Humans are born different from each other not too fragmented, but to respect each other. Have you ever thought about changing others? Or even think your life will be much better if your surroundings change according to what you imagine. Our world is not perfect, but if you want to change it, you have to start with yourself. Look in front of the glass and ask the person in front of the glass to change. That's the only way. If we want to make the world better, look at ourselves and make a difference. As quoted in the song: "There are people crying and people dying and our world is suffering." When people were not yet alert to the issue of global warming, Michael was the first to call this issue of global warming. It now depends on us all to improve the world from global warming, poverty, pestilence, education and other problems that plague us. It is only our concern that will make the world better for our future grandchildren and mankind as a whole. Your experiences and sufferings are not much different from those of others. There will always be a help, support and love for you, even though you currently have no one. If you read this article now, you are getting support and encouragement. Michael achieved a remarkable achievement in his life. His achievements are like a never-ending journey. But the key to his success is that he does not stop. He works very hard. One thing we learn from Michael: if you want something - you can have it as long as you want to be strong and work hard to achieve it. So go ahead and never stop. As often as we may think that we are the world, we will not feel lonely. The only way we can achieve prosperity is if we work together. One person suffers then we all suffer, one grieves then we all grieve. We are all connected to each other as human beings so that if one person is hurt, it is our responsibility to help him. As quoted in his song: "We are the world, we are the children and we are the ones who make a brighter day, so let's start giving." What can we learn through his life? When you become a great person and your light shines so brightly, many people try to knock you down. Do not let these people or anything else extinguish your light, and let us not be afraid of not having the opportunity to give something to the world. There are still many places in the world where you can give the light together. Maybe you hate your body shape, your face, your skin colour or your hair. From now on STOP hate your own physical. That is you! So how can you not love yourself? Your body is the gift of the Creator. Do you reject and hate His creation? You do not have to visit the Fantasy World to play and laugh like a child. Release your childish nature. Jump with your hands up and live with the children's joy. Look at the world with miracles. Enjoy each day with gratitude. Michael, thank you for what you have given us. Rest in peace. We will always remember you.